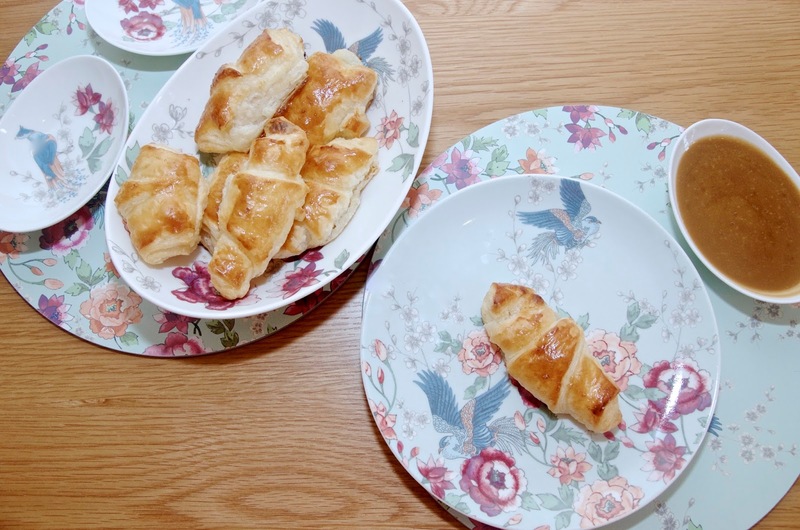 The idea for this recipe came from two different sources really... Firstly, I love chocolate croissants, but my husband isn't such a fan of chocolate, so he'll never eat them with me. 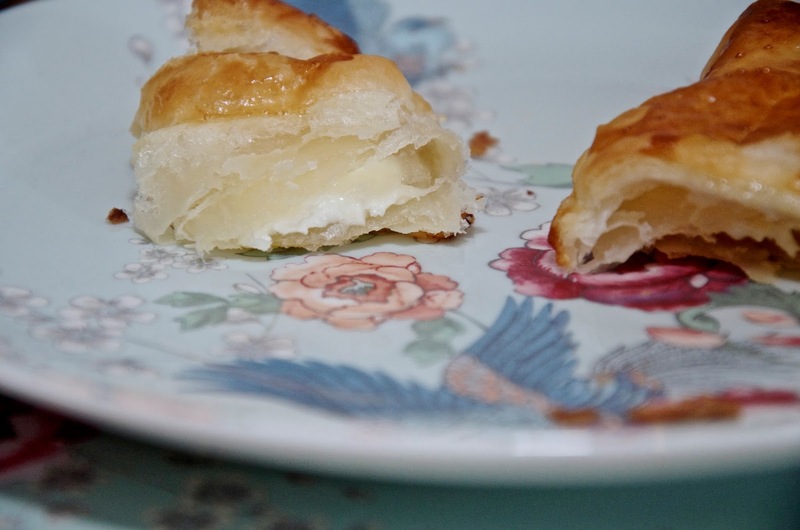 He does however eat white chocolate, so a lightbulb went off in my head one day when I realized that I couldn't recall ever seeing a white chocolate croissant. I'm not saying they don't exist... I'm simply saying they're not common enough for me to have ever seen them either online or in a bakery. 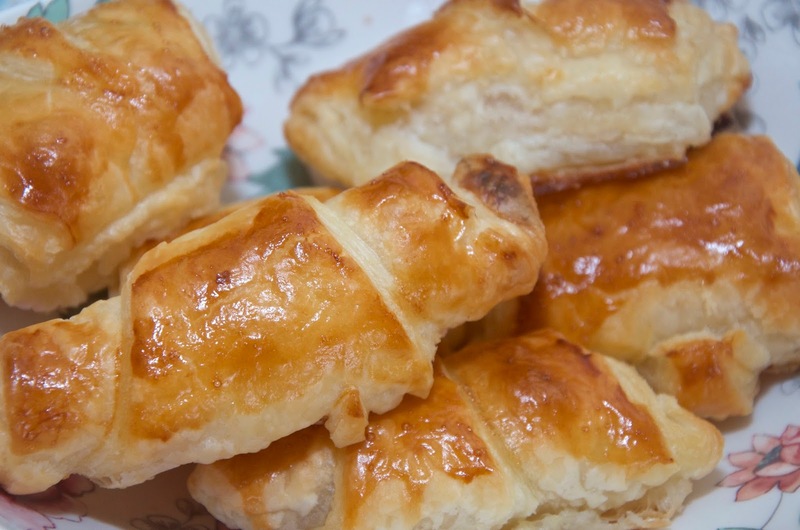 With this in mind, I set out to make a quick & easy cheater's version, quite frankly because I don't have the patience or the skills to make real croissants from scratch. The idea for the dipping sauce had a much different inspiration. Quite frankly, I got some new dipping bowls from the Monsoon by Denby Kyoto Collection and I couldn't wait to use them. 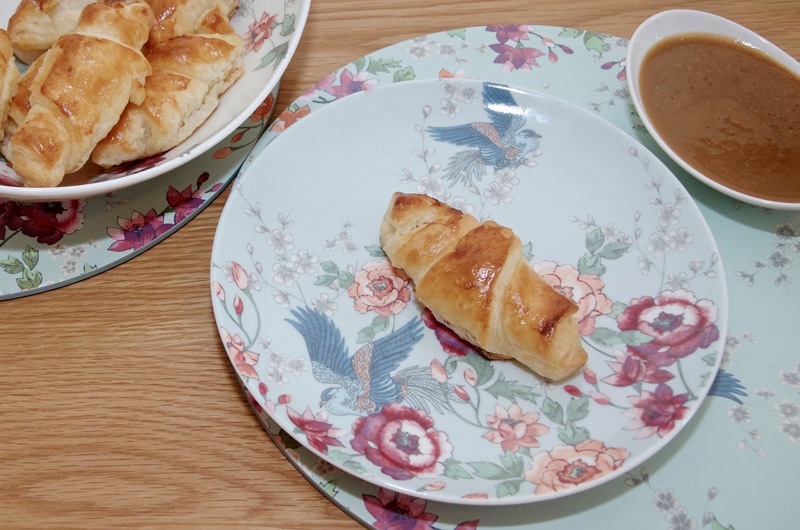 Infused with painterly patterns in soft watercolours that complement the fine cream china, these asian-inspired dishes are just beautiful and there are pieces to suit any style of dining, whether formal or informal. I personally love this pattern for tea or brunch... It's so soft and feminine, perfect for entertaining the girls or adding a pop of gorgeous pastel colours to the table! 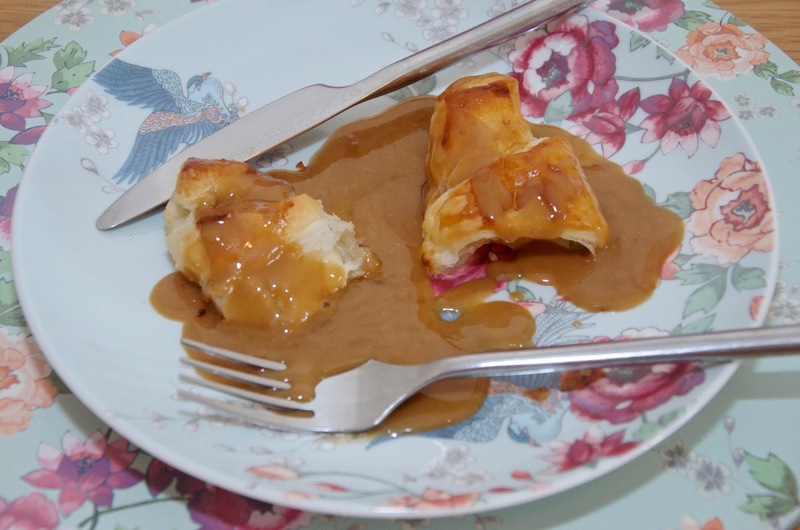 When trying to find a sauce as an excuse to put these pieces to use, I reasoned that the sweetness of white chocolate, the buttery pastry and the salty caramel would work nicely together. I was right... This is a breakfast worthy of Christmas morning in my opinion. It's so sinfully delicious and decadent! While my intention for this recipe was originally for a breakfast or brunch treat along the lines of cinnamon rolls or pancakes, I wouldn't be offended if I were served this as a dessert. It's rich, satisfying and warm. Pair it with a hot cup of coffee and it's heaven. I would even consider this as a little Autumn evening treat, perhaps after Bonfire Night Fireworks or on Halloween. It doesn't hurt that it takes almost no time and very little effort to make. You can have this on the table quite quickly and of course the dipping sauce is totally optional. The croissants are quite lovely on their own. 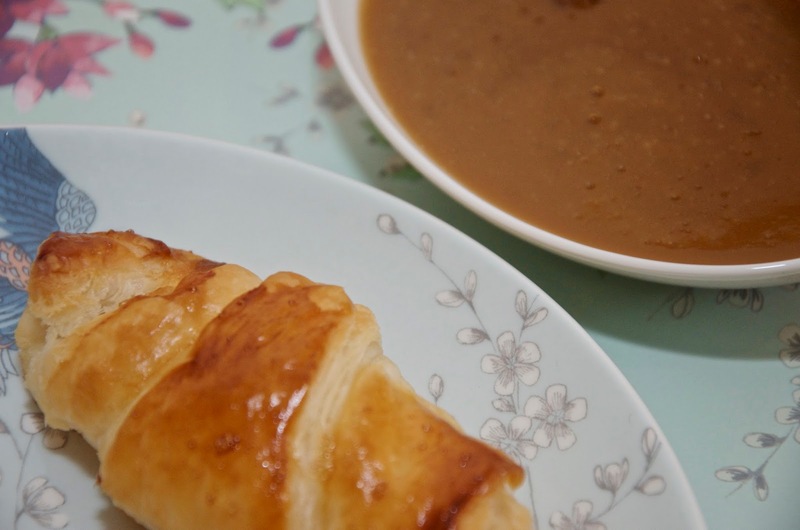 If you do opt to make the sauce, it's lovely on the side for dipping, but it works drizzled over the croissants as well. 1. Preheat the oven 200° C and prepare a baking sheet by spraying with non-stick cooking spray. 2. Unroll the pastry on top of a cutting board, leaving it on its white paper lining. 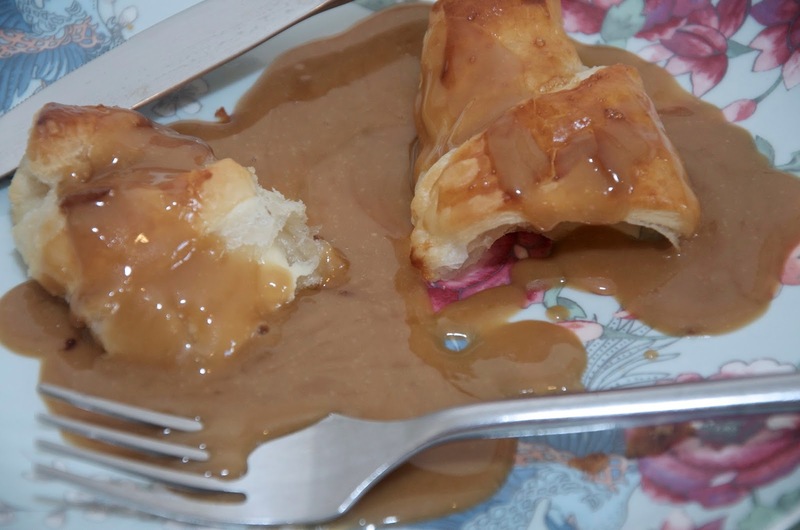 Cut the pastry in half lengthwise using a sharp knife and then do the same across the width. Slice the pastry again from corner to corner until you have 8 triangles. 3. Chop the white chocolate bar into 8 pieces, keeping them as even as possible. If the pieces are too big, you might what to then chop each piece in half so they're easier to work with when you stuff the pastry. 4. Peel off a piece of pastry and place a piece of white chocolate at the fat end of the doughy triangle. Tuck in the sides and then roll until you have a sort of crescent roll shape and place it with the triangular tip on top on the baking sheet. Repeat this until you have 8 rolls, spaced out evenly on your baking sheet. 5. Brush each roll with the beaten egg and bake for 20 minutes or until puffed up and golden brown. 6. While the pastries are baking, you can get on with making the sauce. In a medium saucepan or frying pan, melt the butter and dark brown sugar, stirring together gently with a wire whisk until you have a dark syrup, getting out as many of the lumps as possible. 7. While still stirring, gradually pour in the double cream and continue to stir gently with the wire whisk until it's all combined. Do the same process with the milk. 8. Let the sauce bubble on the heat for about a minute, being careful not to burn and add a pinch of salt, stirring one last time. Remove from the heat to a dipping bowl or pouring jug and sprinkle with another pinch of sea salt flakes. 9. Serve both the croissants and the sauce warm. For more information on the Monsoon Home Collection by Denby and the Kyoto pieces pictured above or to buy, visit Denby.co.uk.